First off, I want to apologize because I know it has been quite some time since I have posted anything new. I promise I will be catching up on all of my commenting and messages from other sites. I also want to take a moment to thank Manu from Manu's Menu for awarding me with the Sisterhood of the World Bloggers Award. Thank you so much Manu! Manu has a beautiful blog with delicious, mouth-watering recipes, so be sure to check her out! Furthermore, to see who I have passed the award along on to, please click here. Now, like I said before, I know that I have been away for a little bit, but I promise I have several recipes that I have been working on that will be coming up this month! To start things off, I have decided to share this tasty, yet very easy to make, broiled salmon with roasted asparagus and lemon risotto. Preheat your broiler on high and position your oven rack to the middle/lower half of the oven. Combine all of the spices in one bowl. Add the juice of one lemon and stir together until all of the spices start to clump together. Keep adding as much or as little lemon juice as you wish to the spices. Using a pastry brush or your hands, rub the spice mixture all over the salmon. Sprinkle the salmon with salt and pepper to taste. Finally, slice the other lemon into several round pieces and lay them over the salmon. Once ready, take a baking dish and line it with tin foil. Place the salmon on the tin foil and cook in the broiler for about 15 to 20 minutes. My broiler takes a little longer so just be sure to keep an eye on your salmon. 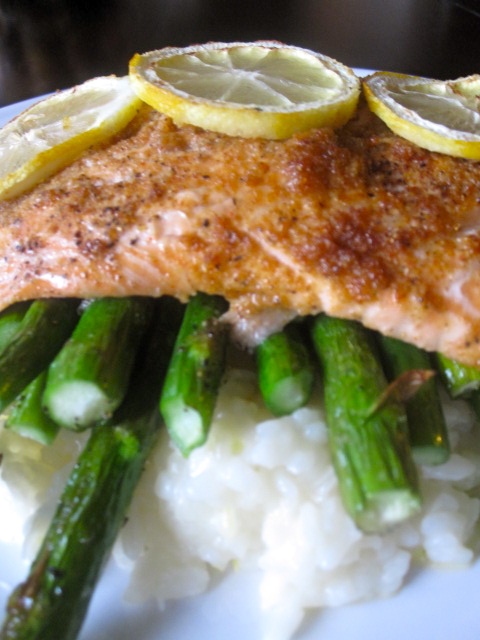 When done, leaving the lemon slices on, remove the salmon from the oven and serve over a bed of lemon risotto and roasted asparagus. This looks wonderful! I just picked up asparagus and fresh salmon at our Farmer's Market this afternoon! Glad to see you back and what a way to get back into the swing of things. 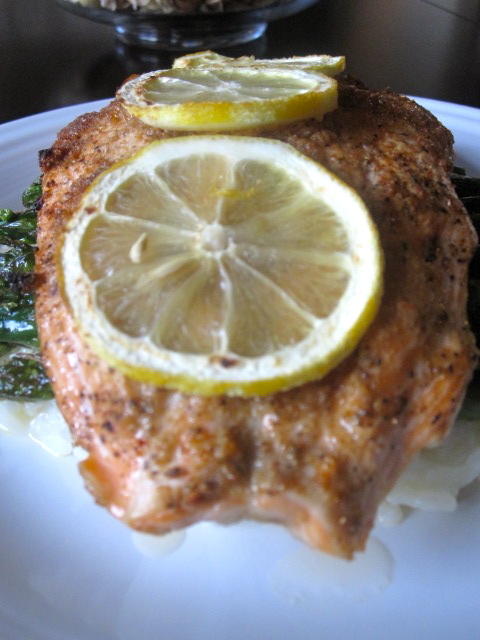 Lemon risotto with this salmon and roasted asparagus is pure heaven on a plate! this looks like a great meal. I love all the items in this-nice preparation on the broiled salmon. I love salmon and that looks really tasty. That looks really delicious! Thanks so much for sharing it! Salmon and asparagus!! Perfect together! We have so much salmon here in Sweden, I cant wait to try this. I have always been afraid of the broiler for some reason. I am now excited to try! Aw don't be afraid it's well worth it! If not, you could always bake it at 350 degrees for about 20 minutes. Gorgeous meal. I find salmon makes such a perfect companion to zesty flavours and yet still holds its own next to the rich risotto. Risotto is one of my all time favorites. Love it. so very lovely and can't wait to try it. Thank u so very much for sharing. Congrats on your awards, and on the Top 9 - yay! Love the touch of spice with this salmon. Wow, what on amazing dish. I love it!!!! can't wait to try it. thanks for sharing. Your salmon sounds mouthwatering...I have never broiled it but I will try that. Lemon risotto with asparagus is honestly one of my favorite side dishes for fish! This looks amazing. I love both Salmon and Risotto and lemon asparagus has always been my favorite way of making risotto. Thanks so much for sharing this! This sounds delicious! We love to use asparagus as on of our side dishes for fish (especially if it is grilled). We bet the lemon risotto was amazing as well and we can't wait to give this recipe a try!